Urban spaces are full of artificial lights that make the space generally visible, legible and sometimes very crowded of information and lighting signals. Urban lighting is not only about functional luminaries and lighting fixtures but also lighting signs for street information and navigation and communication billboards for commercial advertisements are available. More than this, several informal lighting are available such as the dynamic lighting of cars and motorbikes passing by, the private lighting coming from indoor spaces such as house windows and shop windows are part of the lighting scenario of contemporary cities. Urban lighting can be thought also in a passive and “parasitic” mode: lighting reflections are part of this complex even interesting scenario. Reflections of materials such as water, marble, wet floors create very interesting lighting urban lit atmosphere. More than this, the huge amount of dispersed light coming from different sources (billboards, signage, cars, shop windows, etc…) can be recollected and used for lighting other spaces, creating juxtaposed situations and augmenting the lighting scenario in a comfortable and aesthetical way. In the following lines, some examples of installation and materials that insist on the new ways of parasitizing urban surfaces and reusing dispersed artificial light for a more sustainable lighting project. Is it lighting sustainability something related to technology (energy efficiency, smart sensors and so on) or can be related to the deep observation of the space in order to reuse in a clever manner what it is already existing in the space in order to use light for better and more appropriate aims? Rosaic by Giles Miller is one of recent surface products created with a grids of 10x10mm ‘pixels’ with slanted roofs. The pixels can be inserted to face any one of four directions, allowing imagery with up to four different shades to be drawn in the surface in a fashion that demonstrated the absolute height of creative originality and technical intrigue. This industrial product is interesting because of its relationship with light, creating depth and dimensional perception through the use of lighting reflections and shadows. Another example is the one of the canadian artist Roderick Quinn has developed a product which is ready for series production. His ‘Optical Tiles’ can be used in the planning of interiors, facades and in spatial planning. Quinn’s product included a further dimension, because it’s not just the location of the light source which plays a role but also the location of the observer. As a result the image becomes dynamic and creates an impression of animation. ‘Ombrae’ after the Latin word for shadows is the name of his technique, which after a development process lasting years is now ready to go into full-scale production. Once the digital data has been fed into the computer the dots are converted into 3D pixels with differing angles, and can then be directly stamped out of aluminium panels. Although this also enables large-scale series production, the real attraction is of course that the product can be ‘made to measure’ in a relatively easy way by simply changing the motif. The ‘Ombrae’ technique uses the casting of shadows and differing angles of perspective to create the impression of an animated surface on any kind of material. 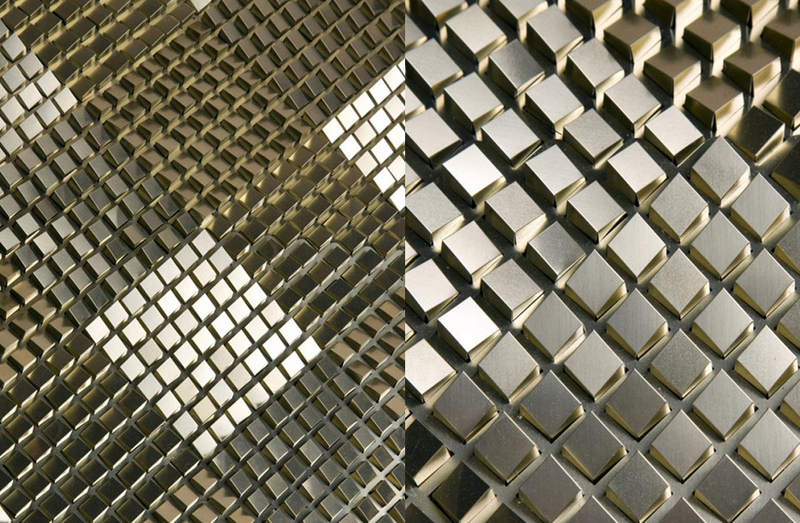 ‘Optical Tiles’ by Roderick Quin, stamped aluminium panels with 3D pixels. However, Quinn’s most valuable product is in fact a service – his ‘Ombrae’ technology represents concentrated know-how with a valuable planning service. By means of specially developed software and CNC technology it is possible to make an optical relief out of almost any material – the material as such becomes the image. In the process, however, a wide range of factors have to be taken into account: it’s not just the greyscale of the pixels which are converted to 3D pixels and the lighting conditions at the place of application which play a role, but also the surface features, colour and reflectivity of the material. In addition to its design potential Quinn believes that his ‘Ombrae’ technology can optimise the characteristics of surfaces with regard to heat storage, the cooling of buildings and energy generation. ” The future is made up of light and shadow”. “Olaf’s work has a very strong impact,” says Ando. “You don’t ever see anything like this in my work. In the beginning I thought the tiles were too drastic technically and aesthetically. They arrived late. We didn’t know if they could be affixed properly. It’s difficult to adhere things to the surface,” he admits. This artistic installation into the Ando house is the most dazzling, sophisticated and successful spatial element of Yu-un, the guest house Ando built: ornament, surface, treatment, light response with dynamic natural changes. Leni Schwendinger is a brilliant lighting urbanist whose aim is really to create lighting for people, to relate to each other, to have a great good time, to increase the experience of people that live in cities after dark. She redesigned the lighting experience of the bridge of Manhattan with the idea of creating a room: if the citizens see the city as home, than they would share that with their friends. The bridge, observing the scenario of the city and listening from the neighborhood, became a luminous room from a place of darkness, dust and dirt. In the project, she inserted also a set of reflectors that would point light of the passing cars to the ground creating a unusual yet interesting experience. The project was so intended to create a new room in the city thanks to light. “Reflective panels emit a carpet of light onto the roadbed creating a luminous urban “room” that unites a previously divided avenue and two neighborhoods”. Leni explains. Thanks for quoting my project! Thanks for quoting my project. Fascinating premise.